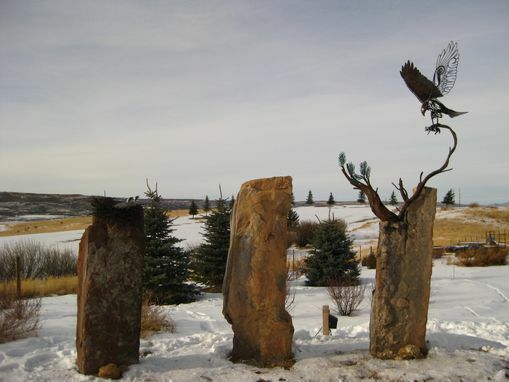 Stone pillars are the home of this steel metal sculpture. A Bristlecone pine is sculpted around the stone features to appear to be growing out there from. Copper sprigs (pine needles) are aged and greened to look very natural. 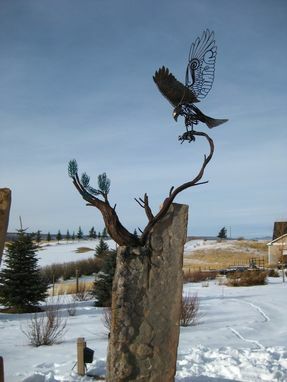 The Hawk above has caught a ground rodent and lands atop the tree to prepare the catch for her young. 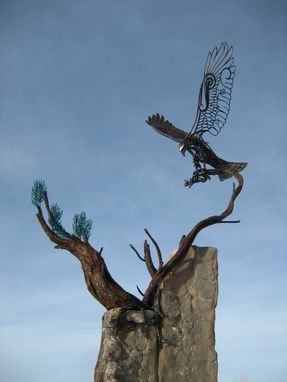 (the nest and chicks are atop the opposite stone pillar) Part of the adult bird is fully sculpted feather by feather, while the other is made in scroll works and contour lines. I have seen fit to finish sculptures in this fashion so it makes obvious that the work is a fabricated, welded original and not just another mold cast. What is your original idea? Lets put it to form!